Normandy Life: Mosaic Monday # 88 - "Achilleion" Sissi's Palace in Corfu. Mosaic Monday # 88 - "Achilleion" Sissi's Palace in Corfu. In the early 1980's the Senior Partner's career took us to Bavaria, West Germany, we lived there for over 13 years. Our home overlooked Starnberger See (Lake Starnberg) and it was whilst I was living there that I came to learn a little of the history of Empress Elisabeth of Austria, (1837-1898). 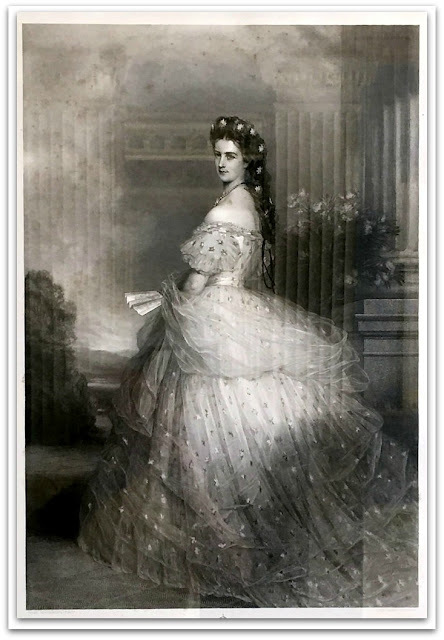 "Sissi" was the daughter of the Duke Maximilian Joseph of Bavaria, wife of Emperor Franz Joseph I of Austria and half sister to King Ludvig I of Bavaria. 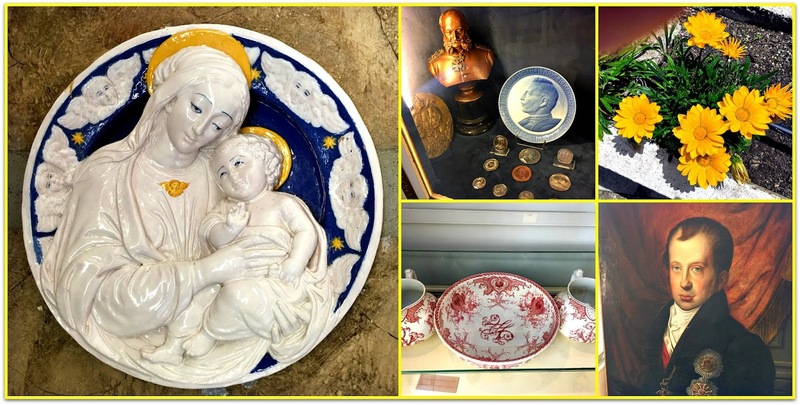 As a child Sissi enjoyed spending time with other family members by Lake Starnberg at their summer residence Possenhofen Castle, situated in the pretty lake shore village of the same name. Sissi's adult life was not as pleasant. Her marriage to Franz Joseph was not a happy one, overshadowed as it was by her domineering mother in law who also happened to be her aunt, the Archduchess Sophie (of Bavaria). The suicide/murder of her son and heir, Rudolf, Crown Prince of Austria, and his mistress at his hunting lodge, Mayerling, in 1889 was a tragedy from which she never recovered. 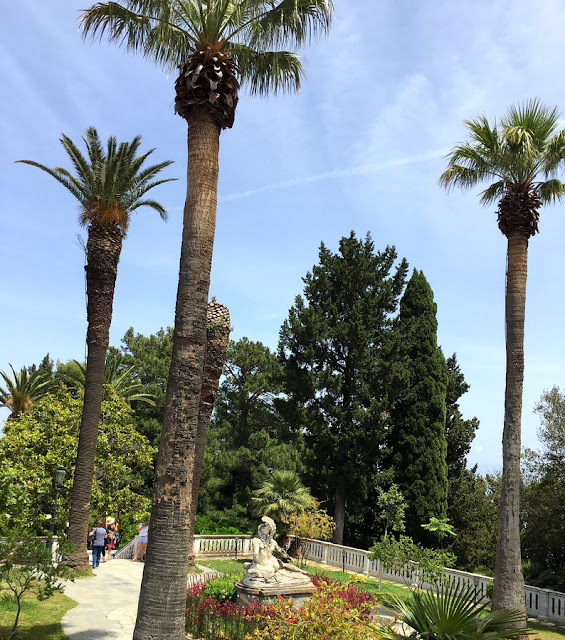 Elisabeth fled Austria and travelled to the island of Corfu, a place she had visited often during her extended travels and a sanctuary from life at court in Vienna, Austria. 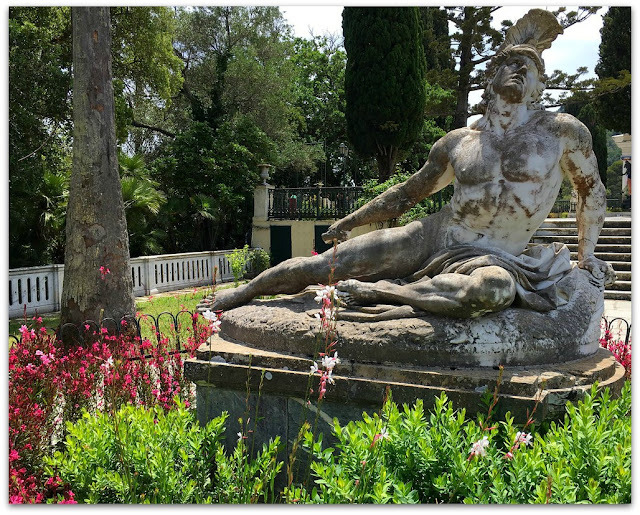 After purchasing a large villa in the village of Gastouri and later also the land surrounding it down as far as the coast she instructed the Italian architect, Raffaele Caritto to design a palace in the Pompeian style. Building began in 1889 and took two years to complete. 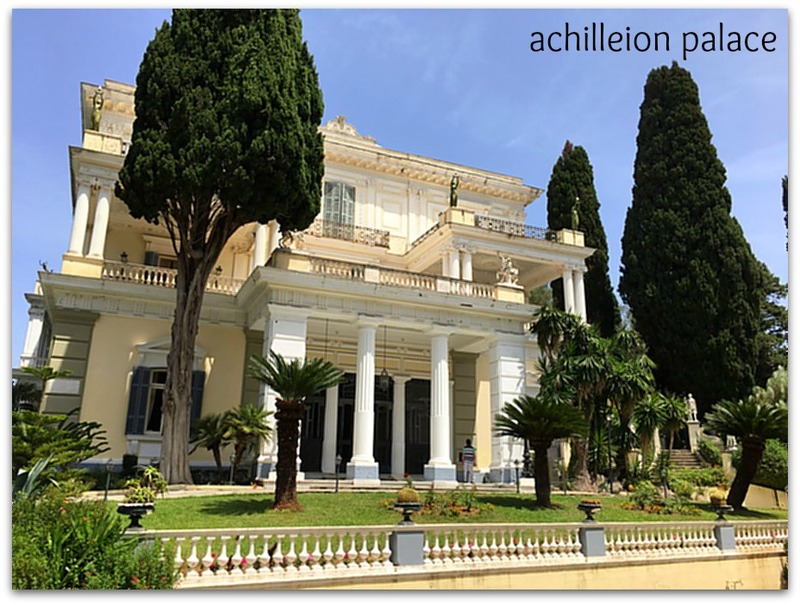 As a great admirer of Achilles, a hero of Greek mythology, Elisabeth named the palace Achilleion and had several statues of him installed in the house and throughout the grounds. She visited Achilleion twice each year until she was murdered in 1898 in Geneva. The palace remained closed until it was sold in 1907 by her daughter, Maria Valeria, to Kaiser Wilhelm II. Achilleion Palace is now a Museum operated by the Greek Tourist Organization and we were able to tour both it and the extensive gardens during our recent stay in Corfu. 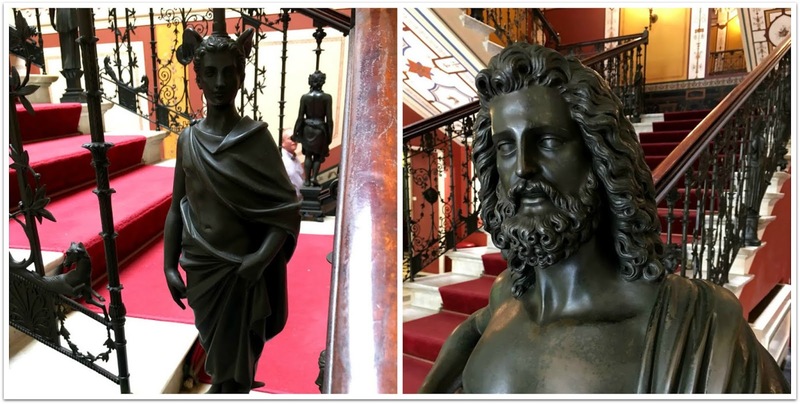 It was wonderful to walk the halls and climb the elaborate staircase however many of the rooms were unfurnished and in need of some TLC. I so enjoyed learning more about the Empress Elisabeth and seeing her most favourite home but was saddened to discover that her visits were cut short when her life ended so tragically at the hands of an assassin. On a lighter note to finish, some movie trivia for you to enjoy. The teenage German actress Romy Schneider starred in a trilogy of movies entitled "Sissi" (1955, 1956 & 1957) playing the role of Elisabeth. The three films were later condensed into one version "Forever My Love" and dubbed into English. In 1968 Omar Sharif played the leading role of Crown Prince Rudolph in a movie based on the Mayerling Incident. Scenes from the 1981 James Bond movie "For Your Eyes Only" were filmed in the Casino on the upper storey of Achilleion. Lovely visit through your eyes today Maggie, very much enjoyed. such a tragic story. I am sorry that she didn't find long term peace in Corfu. I wonder what her dreams were when her portrait in the beautiful dress was done. Have a good week and thank you again for the link up. What a tragic life "Sissi" had! 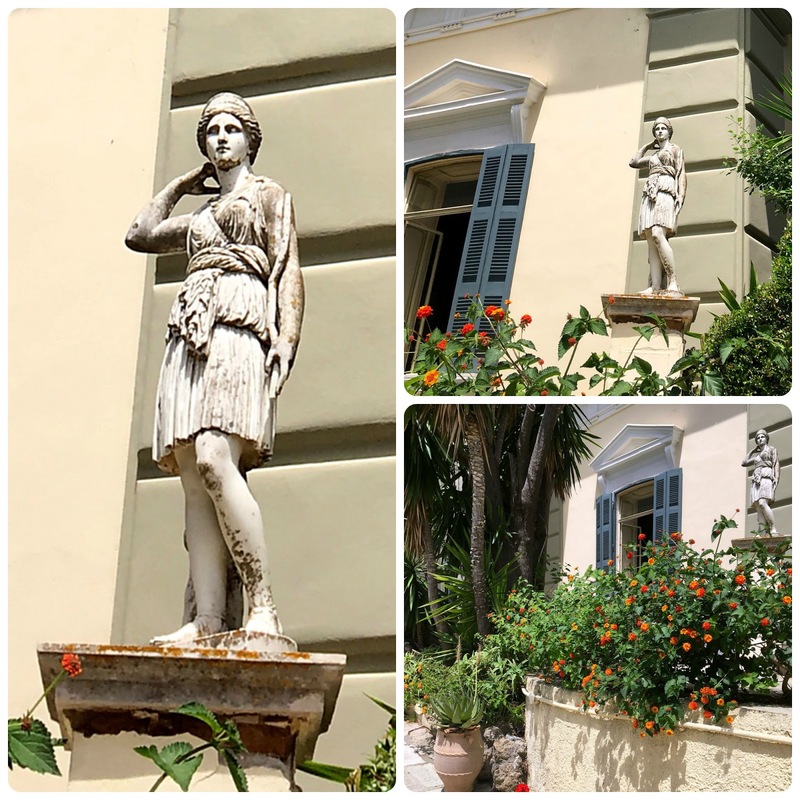 Her Corfu house looked like an interesting place to visit. I've always liked Omar Sharif, ever since his role in Doctor Zhivago. Have a wonderful week, Maggie! Fascinating post Maggie and so interesting that you have the personal connection with Bavaria and Corfu. How sad her life was but what a beautiful home...I love this style of architecture. My husband and I both looked at your post and talked about the tragedies of royalty. You think of wealth and romance of their lives but it was always touched with sadness...and many time murder. I mentioned a couple of movies that were set in the town I featured today...coincidentally. Happy MM! This looks like a gorgeous place. I'm somewhat familiar with Sissi's history and that of her children -- a great tragedy. But I didn't realize she was murdered too. I need to do a little homework! 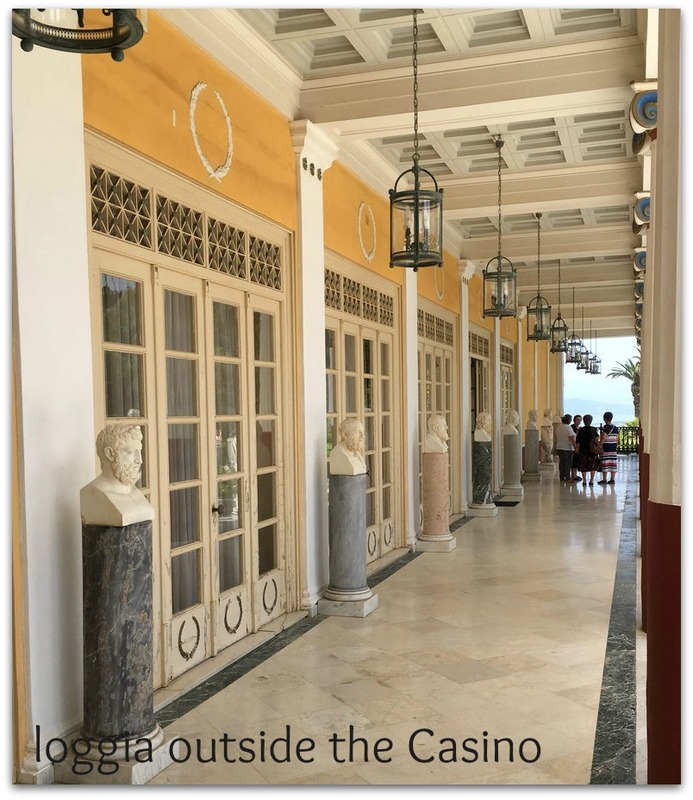 I've always enjoyed visiting Corfu, Maggie, and your photos do the Achilleion justice. It is a lovely place. My horizontal mosaic didn't work out as well as I hoped this week, see what you think, Maggie. "Sissi" had such a tragic life. 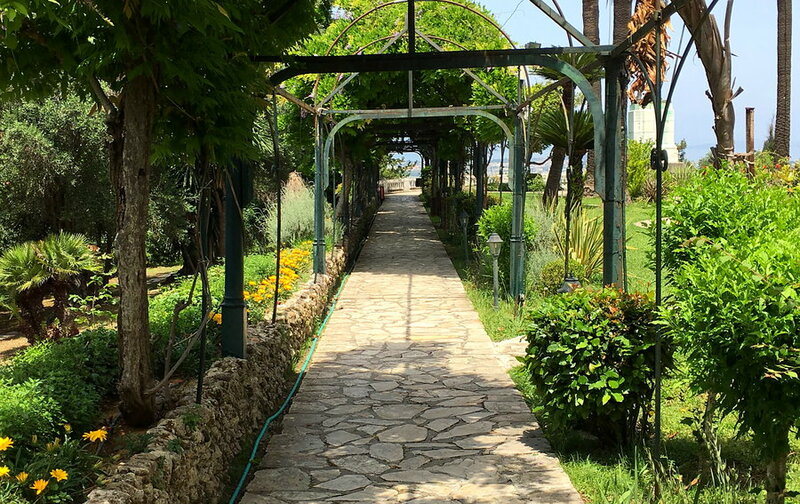 I hope she found some peace in that beautiful villa in Corfu. Thank you for sharing a bit of the history and some photos. It's too bad it's not being very well maintained. I would love to stroll that loggia. Dear Maggie - Thank you for sharing the story of Sissi, otherwise I would’ve been less likely to learn about it. 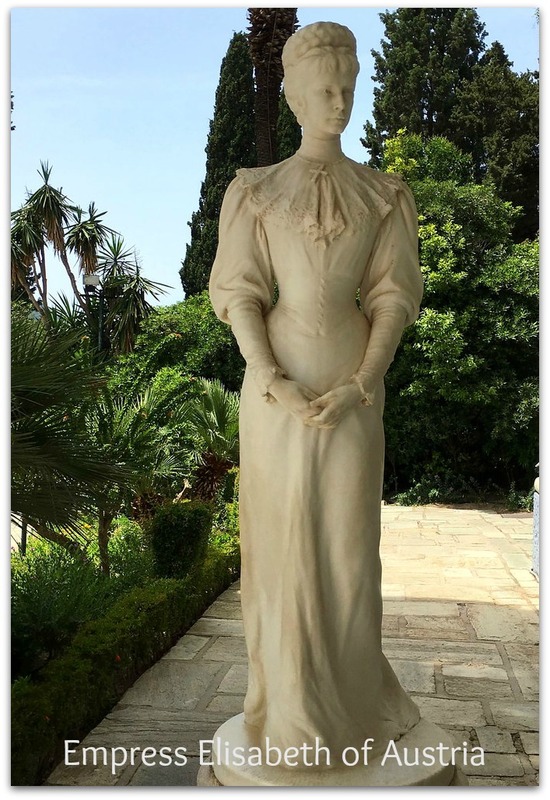 Her life after marriage was really sad but her statue stands noble, elegant, and composed. Achilleion Palace Museum is a nice place to look around. I enjoyed the photo tour. 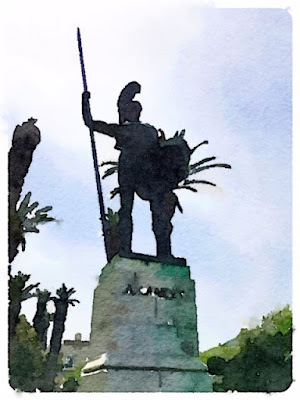 I wonder if the watercolor was made by Waterlogue which I like to use. 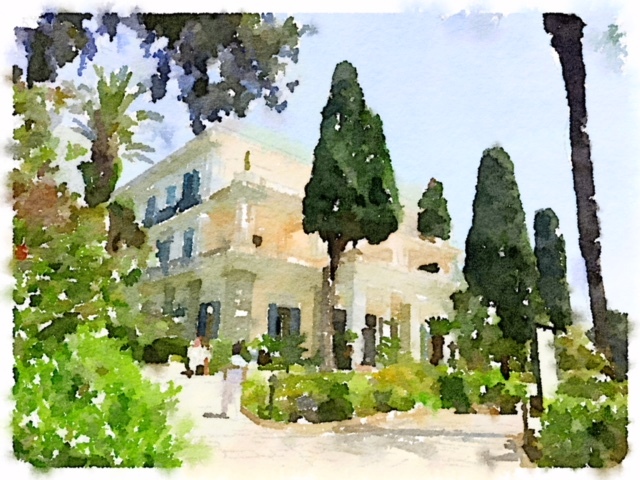 Yes, I did use the Waterlogue app for a couple of the images, it's a fun toy to play with! Maggie - it is quite fashionable right now for women to 'fight for their rights'; at times I think we should consider how far we have come … it was very tough to be a woman in the 'old days'! Thanks for sharing this beautiful palace with us; I am sure the Greek Tourist Board would like to fully re-furbish it but probably suffers from lack of funding. Enjoy your week ahead! Wow - I bet your life in Bavaria was really interesting. As was Sissi's life, but what a lot of sadness she had to contend with. 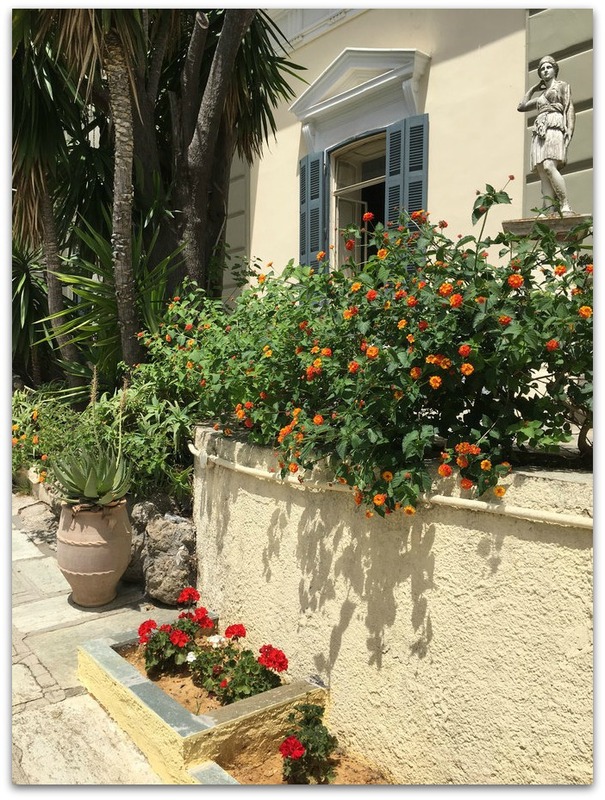 The photos show Corfu to be a bright and interesting place, nevertheless! Hello Maggie - thank you for hosting. I was attracted by your topic today as I discovered lots about Sissi in Vienna earlier in the year. I have tried to join in MM by doing a quick post to see if I could manage it. (Turned out to take hours as I was using my daughter's Mac, which decided to shut down and delete all my 'guest' files just before I could post...never again!) This means it is now 10-to-no-longer-Monday, so no time to read other mosaics - will do so tomorrow! This is a beautiful place and quite a story. I hopes she found peace in Corfu. As places to heal the heart, this looks like one of peace and solace to do just that. Interesting post. Being royal and rich does not protect you from disaster. It was interesting to know about the place. The building looks beautiful with the tall green trees on their sides. So interesting. Who murdered Sissi? and why? She was beautiful an and you had a great get away. I am glad that Mosaic Monday began again--it keeps me discipline. What a wonderful place to live. Most interesting.